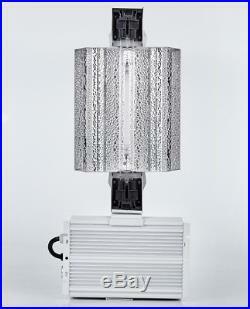 The Open DE reflector is designed for uniform growth over the lights footprint. The aluminum of the reflector is European hammer tone that is 99.85% pure and has 95% reflectivity. This DE reflector is optimized for efficient heat management while delivering uniform light spread. 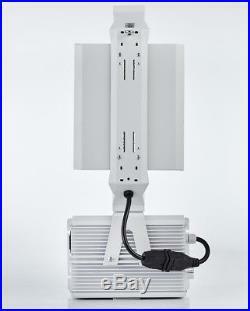 Features: Reflector: Size:25.5" Long x 12" Wide x 6 High Steel bracket with white powder coating. Imported German aluminum and size 11'' × 9.50'' 16AWG/3C SJTW 240V 6-15P Plug cord, L=16FT Double-ended system delivers higher PAR value with incredible uniformity Open design for maximum light output, optimum heat management, and longer lamp life Highly efficient for overlapping footprints of multi-light configurations Premium aluminum European hammer-tone interior: 99.85% pure, 95% reflectivity Plastic K12 x 30S high temperature lamp holders. 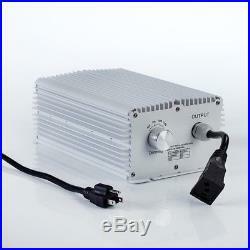 1000W HPS MH Digital Dimmable Double-Ended 120/240V Ballast Size:10.77'' (L) 7.01''(W) 3.64''(H) Wattage: 1000W Input: 120240V / 5060Hz, Min Power Factor: 99% THD: <10% Crest Factor: <1.7 Dimming Type: 600W/750W/1000W and Super output 1150W Runs on 120/ 240V volt power; FC listed; ETL certified 16AWG/3C SJTW 240V 6-15P Plug cord, L=16FT. 1/8 rope Hangers Raise and lower light fixture in one simple movement. Locking mechanism 1/8 rope that supports up to 75 lbs of tension (150 lbs total) High quality stainless steel latches Compatible with all parabolic and round reflectors, as long as hooks and locking latch suit. Perfect for hanging reflectors, light fixtures, carbon filters and ventilation equipment. 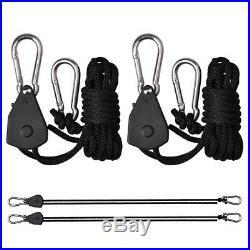 Package includes: 1 pcs of DE 1000w dimmable ballast 1 pcs of DE Open reflector 1 pair of heavy duty 1/8 rope hangers / metal hooks. 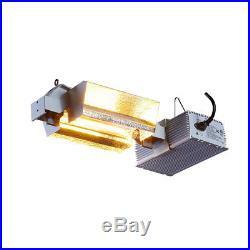 The item "1000W Watt Double Ended DE MH/HPS Grow Light Fixture 240V Ballast WithNo Bulb" is in sale since Monday, February 26, 2018. This item is in the category "Home & Garden\Yard, Garden & Outdoor Living\Gardening Supplies\Hydroponics & Seed Starting\Grow Light Kits". The seller is "all-the-premium" and is located in Azusa, CA/Linthicum, MD. This item can be shipped to United States.